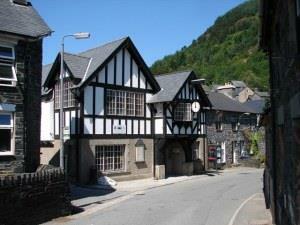 Corris VillageA former slate mining village set within the Dyfi Forest 5 miles north of Machynlleth, Corris has a population of some 600. The Corris Craft Centre showcases the work of local craftspeople and several former slate mines penetrate the hillsides; parts of what was once Braichgoch Quarry can be visited on a trip to "King Arthur's Labyrinth" and underground tours are available from Corris Mine Explorers. The narrow gauge Corris Railway from Aberllefenni used to carry slate to Machynlleth to be shipped from quays on the River Dyfi; the Railway’s stable block is now used as a Museum for the line. Part of the route has been restored and visitors can travel on a steam train to Maespoeth Junction. A former slate mining village set within the Dyfi Forest 5 miles north of Machynlleth, Corris has a population of some 600. The Corris Craft Centre showcases the work of local craftspeople and several former slate mines penetrate the hillsides; parts of what was once Braichgoch Quarry can be visited on a trip to "King Arthur's Labyrinth" and underground tours are available from Corris Mine Explorers. North of Machynlleth on the A487 Dolgellau road.